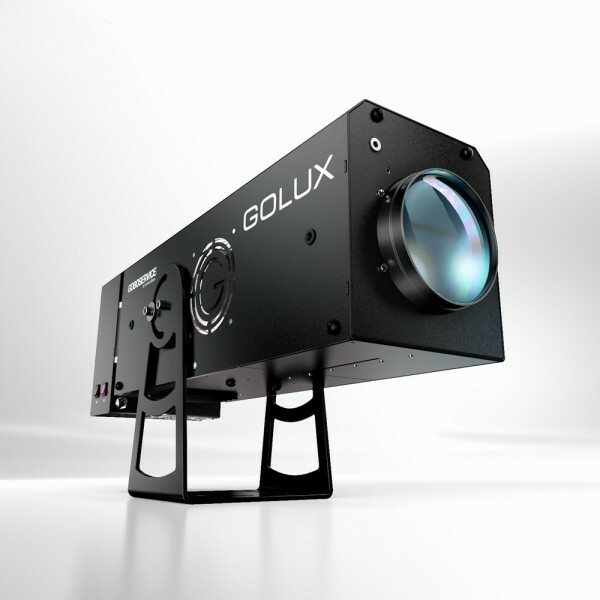 The GoLux 600 Wide Effect model, equipped with a wide-angle lens (41°) and an animation wheel, is suitable for projection of shooting stars or snowfall effects when a required Throw Ratio is up to 1.3 (ratio between the distance from a projector and the size of the projection).Every detail is designed to allow extreme ease of use and ensure flawless performance in terms of brightness and efficiency far superior to any other product of the same range. The GoLux series of projectors are created to best meet the specific needs of architectural projections. The tailor-made rain cover makes it perfect for outdoor use. The GoLux 600 Wide Effect model, equipped with a wide-angle lens (40°) and an animation wheel, is suitable for projection of shooting stars or snowfall effects when there is short throw distance but wide surface to be illuminated. User-friendly: The all-aluminium body and the electronic ballast mean that the projector weighs only 15kg. The solid base makes mounting easy and safe (with the pole/wall mounting bracket accessory). To switch the projector on you simply plug it in without connecting it to any other devices... However, if necessary, the projector can be connected to the DMX. Versatility: The modular design allows you to enjoy different effects with a single projector. The gobo rotator, gobo changer and dynamic effect wheels are interchangeable. The lenses (wide angle, medium and zoom) can be changed in a few simple steps depending on the task.